Okay, so here's another cheap wine. We're talking like $4 or $5 a bottle cheap. And hey, there's nothing wrong with that. It just lowers my expectations a little. Shiraz is famously grown in Australia, but this bottle is from California. And as I've said before, Shiraz is technically the same grape as Syrah. However, since the grape was historically grown in two different climates (France and Australia) which produced different flavor profiles and were subsequently named differently for each place, wineries outside of these regions tend to name their wines depending on whether their wine has Shiraz (heavier, jammy) or Syrah (lighter, peppery, acidic) characteristics. Back to this bottle. This is from Barefoot Cellars, a California winery known for making affordable/budget wines which can be found just about anywhere. They also produce pretty much all of the major varietals. This is their Shiraz, which unfortunately has no vintage. The Barefoot Shiraz pours a dark garnet verging on purple and has aromas of grape jam, grape jam, and oh yeah, more grape jam. It tastes moderately sweet and predominantly of blackberries with a hint of spice. It is a bit too thin, mild, and short-lived. Nothing really interesting or all that tasty going on here. Drink This: if you've already had a few drinks and you don't really care what you drink. This could be good to serve to drunken house guests so they don't guzzle down all of your good stuff. And hey, it's SUPER CHEAP! Don't Drink This: if you want something interesting, or tasty, or complex. Not to be harsh, but this wine is a bit too much of nothing at all. I really wish it had a vintage so they could tweak the blending yearly. I've had considerably better wines from Barefoot... oh well. I just finished a bottle of this, and was keen to find more. 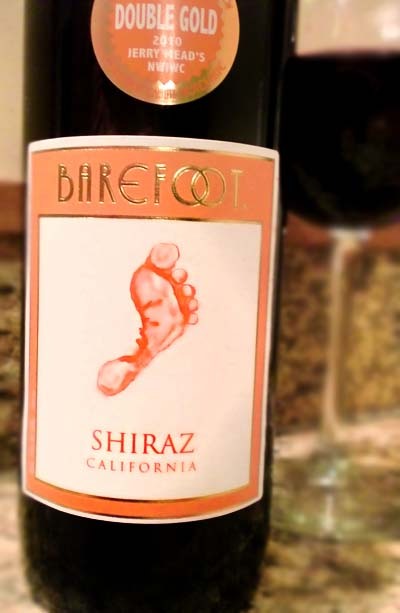 I googled Barefoot Shiraz, and was surprised to find this site, as you're in the U.S.A, and I bought an Australian Barefoot Shiraz, which looks almost exactly the same. The only difference is the Australian version is a Svenston twist top, and it has a different round sticker. But it definitely claims to be Australian. I would be interested to see the taste difference, and also find out why this wine is claimed by both countries.